Voice recorder apps are very useful in some particular situations. 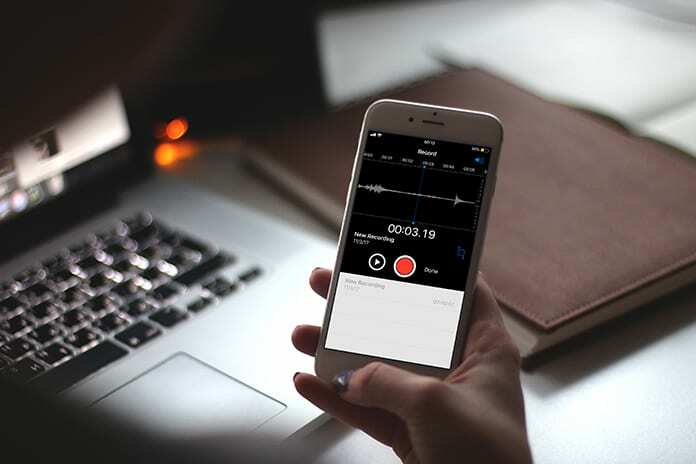 Whether you are a student or you are a journalist, you must have a perfect voice recording app on your smartphone. On the other hand, if you take audio notes or you are a private investigator, you would need a voice recorder app on your iPhone. The question is which is the best voice recorder app and how to find it? Well, you don’t need to worry about it anymore. We will show you some amazing voice recorder apps for iPhone. You can get these apps from App Store easily. We know that a lot of people don’t look for the latest voice recording apps and they use those old apps in their phones for years. But why to use old voice recording app on your iPhone when you have the option to get new? So if you are ready to install some of the best voice recorder apps on your iPhone, have a look at the list below. If you are new to voice recording and you don’t know about any voice recording apps, you will be glad to know that an app named Voice Memos comes with your iOS. It means you get a built-in voice recording app so that you won’t have to download any application for voice recording on your phone. Voice Memos is a great app that provides you easy and reliable voice recording services. The best thing about this app is you can get it for free from App Store. Voice Memos comes with great features like saving and trimming the recorded voice easily. You can then save it and share it whenever and wherever you want. 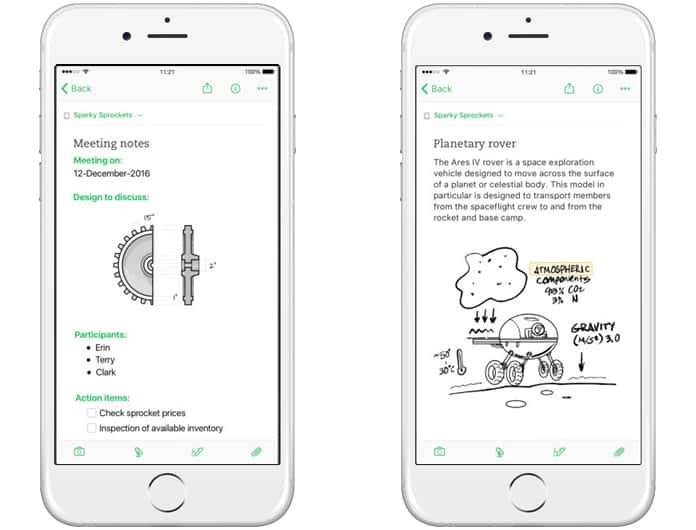 Evernote is another great voice recording app for your iPhone or iPad. You can get its basic plan for free. However, if you want to record more per note, you will have to buy its yearly plan available in different pricing. In this app, you can edit the different type of notes. You can introduce voice recording to every note which you can save later. In Evernote screen, open a note and tap the microphone icon. Now you can record sound in high quality. The basic plan of Evernote provides 25 MB of recording space per note. However, you can make different notes with 25 MB of recording each. On the other hand, you can buy 50 MB or 200 MB recording space per note from the App Store. This app is compatible with iPhone, iPad, iPod touch and Apple Watch. 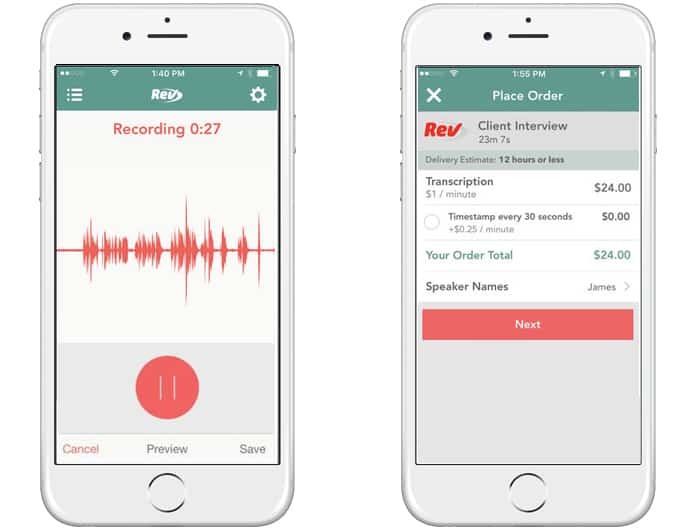 Rev is an amazing voice recording app that gives you a lot of features in a low-cost package. It is available on iOS and Android, and you can get it from App Store. It is the best transcription service available on the internet while it comes to sound recording. You can save the recorded files as well as share them to DropBox, Google Drive and Evernote. You can also rim your recorded files to any length and proportion. 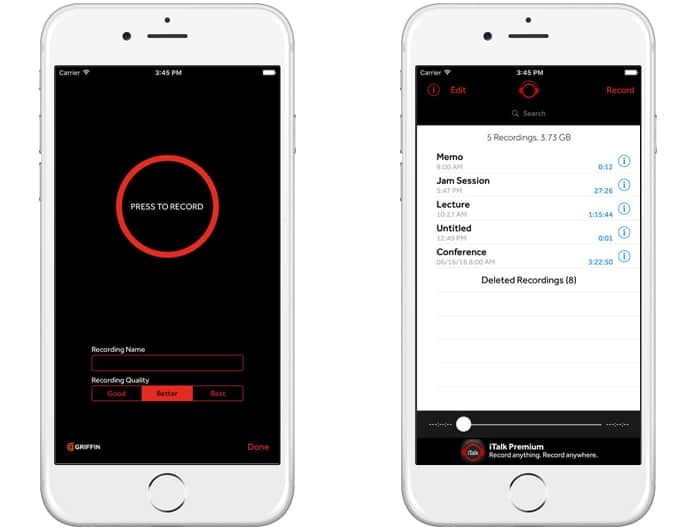 Rev offers background recording which is an awesome feature when you are working on your iPhone. You can download this app from App Store for free and the best thing is that this app is compatible with iPhone, iPad, and iPod touch. 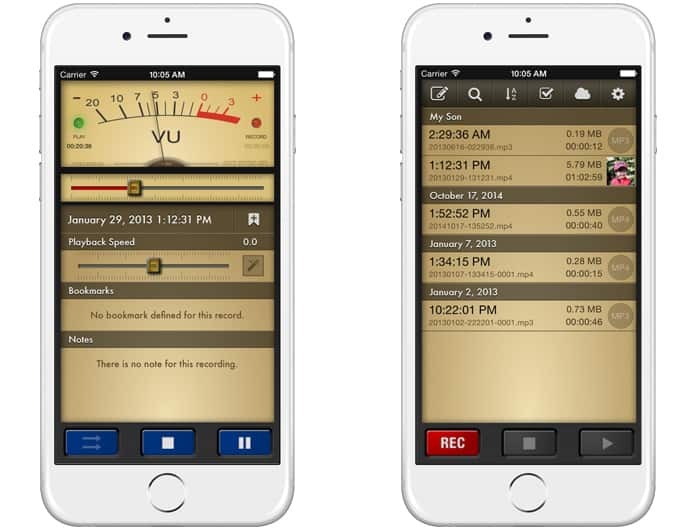 This app is a full-featured recording app with a streamlined and intuitive user interface. There’s a free version, but we recommend you to use the Smart Recorder Premium version and it will cost you only $1.99. This app is easy to use and all you need to do is to press the red button and your device will start to record. You can choose from three levels of recording quality 11.025, 22.05, or 44.10 kHz sample rates, and manage your recordings, all with just a fingertip. Smart Recorder is compatible with iPhone, iPad, and iPod touch. Voice Record Pro allows you to record voice memos and on-site sounds at unlimited length with configurable quality. This app is a professional voice recorder. You can record in AAC, MP4 and M4A format and export to Google Drive, Dropbox, Microsoft OneDrive, Box Cloud, iCloud Drive, SoundCloud, and FTP servers. This app is compatible with iPhone, iPad, iPod touch and Apple Watch and you can download this app for free from App Store. 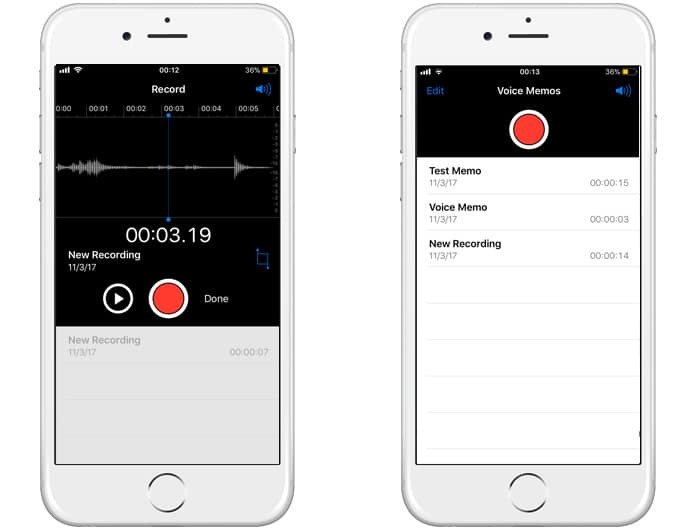 We hope that you liked our list of the best voice recorder apps for iPhone, iPad, iPod touch and Apple Watch. Some of these apps are free or relatively low cost but all of them are easy to use. So, which one did you choose?